Think meringues are no-go for a vegan diet? Think again! This recipe for Vegan Matcha Meringues is proof to the contrary. Find out how to make these little delights below! Place a strainer over a medium bowl and strain the chickpeas, catching the liquid in the bowl. Reserve the chickpeas for another use; you’ll only need the liquid, which is called aquafaba. You should have approximately 1½ cups of liquid. Add the aquafaba to a medium saucepan and bring to a boil over medium-high heat. Continue to boil until the aquafaba has reduced to ¾ cups. Transfer the liquid to a container and refrigerate for at least 2 hours and up to overnight. The aquafaba will become viscous and gel-like as it cools and have a consistency similar to an egg white. When you are ready to make your meringues, set your oven racks in the upper and lower thirds of the oven. Preheat the oven to 200°F. Line two baking sheets with parchment paper. In the bowl of a stand mixer fitted with the whisk attachment, whip the aquafaba on high speed until until soft peaks form, about 2 minutes. Add the cream of tartar and continue to whip for another 2-3 minutes, until stiff peaks form. Keep the mixer running and add the sugar very gradually, about 1 tablespoon at a time. Continue whipping until the foam is smooth and not gritty when you rub it between your fingers, about 5 minutes more. Add the vanilla extract and matcha and beat for 1 minute to combine. Remove the bowl from the mixer and load the meringue into a piping bag fitted with a large French or star tip. Pipe 1-inch diameter dollops of meringue onto the parchment-lined baking sheets, about ½-inch apart. Bake for 2 hours, then turn off the oven, prop the door open with a wooden spoon, and allow meringues to cool completely in the oven, about an hour. 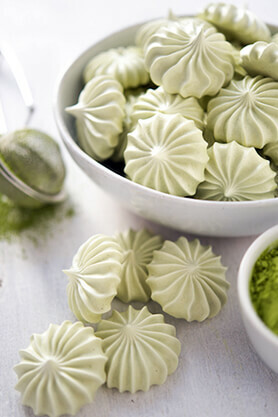 Hope you enjoy this recipe for Vegan Matcha Meringues! They will keep in an airtight container at room temperature for 2 days, or can be frozen for up to 3 months.